The rising cost of higher education, paired with a difficult economy, has many students and parents wondering whether college is still a worthy investment. To prove the value of a college education, schools and nonprofit organizations are turning to forms of digital storytelling. The stories vary among institutions, but all share an underlying message: college is worth it. We use “digital storytelling” here to mean online personal-experience narratives conveyed with photo, audio and/or video. In our search for the best online higher-ed digital stories, we found many student stories told in the third-person and littered with key messages and mission-statement language. The examples we present here are different: they are more personal, more engaging, and we think, more effective. We organize our examples below around four guiding principles in the higher-education digital storytelling. One of the great things about the college experience is exposure to diversity: both of people and of experience. However, many institutions struggle with articulating diversity in an authentic way. Personal narrative collections allow viewers to see and hear a range of perspectives–from the first-generation student to the single mom to the college athlete to the barrier-breaking alum. They also allow visitors to see more of a campus community than can typical website content. 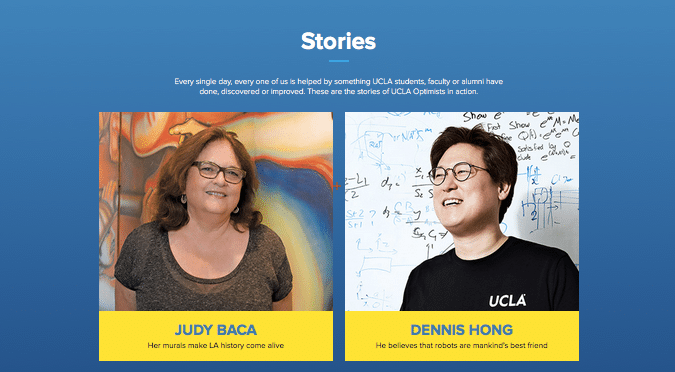 One compelling example of a project and an interface that showcases diversity is UCLA’s “The Optimists.” While the individual stories are straightforward ‘newsroom’-style profiles, the set of stories–which can be easily browsed through and read in one sitting–really capture the public institution’s diversity. They capture stories of students, faculty, alums, and community members helped by UCLA programs and research. Along with diverse voices, it’s also important to consider a range of story topics. Most prospective students are looking for more than just academics from a higher-ed institution. Explore your school’s ties to the arts, sports, medicine, civic causes, community work, religion and study abroad opportunities. How do all of these experiences add value to one’s education? 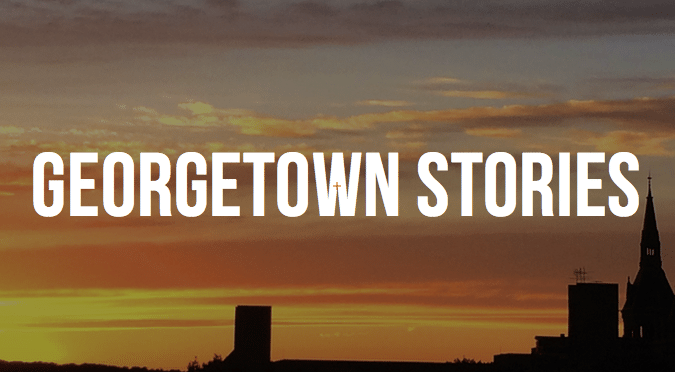 The Georgetown Stories microsite showcases a tremendous amount of video content, through the lens of twelve students. 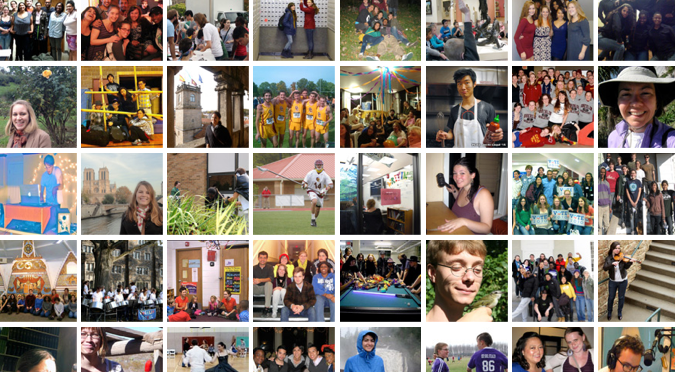 Most of the stories are user-shot, and through the students’ eyes, prospective students can see and learn about everything from special places on campus, to clubs, to academics. During our review, it quickly became clear that a story was more engaging when it was told in the first-person. In this case, students speaking directly to students, donors talking to donors and so on. It was even better if the story branched beyond the institution to cover biographical details. This contributes to plot development and shows the subject’s growth rather than blatantly stating it. Oberlin’s long-running storytelling project, “Oberlin Stories” allows users to submit their own stories via an online submission area, which helpfully describes some guidelines for telling good stories. Along with having the subject tell their story, encourage a conversational tone and avoid jargon. Specifically looking at financial aid, which can be a dry and complex topic, it’s easier to understand requirements and process when they are described in layman’s terms. The University of Notre Dame illustrates this technique with the What They Say story collection. While many higher-ed institutions have invested in professionally produced videos, storytelling today can be done with a range of free or inexpensive tools or platforms. And in many cases, students can tell their own stories better than can a staff writer. Cornell University’s “Life on the Hill” is a collection of uncensored student blogs, to share the Cornell experience with prospective students and parents. Cornell provides a small monthly stipend for a select group of students to post regularly via their chosen blog platform. A similar set of student blogs is available on the admissions page of the University of Denver. Oftentimes, creating a storytelling community doesn’t even require a stipend. Dickinson College has an online story submission form that populates in a Tumblr. Admittedly, these stories are less polished and in-depth than some of the others presented here, but the Tumblr is an easy-to-produce option that is also very easy for users to engage with. In our search for the best higher-ed digital stories, we found stories in all sorts of places: on Admissions pages, on Financial Aid pages, linked to Home pages, and on microsites of their own. The choice of where to place stories is an important one, as it determines who will find the stories and what next steps the stories might encourage them to take. The content of a good digital story inspires action, so you want to be sure to give viewers an easy way to take that next step. On a basic level, be sure to add share buttons and links to additional resources, as in this implementation of student testimonials from Southern New Hampshire University. This is by no means an all-inclusive list, but these four guiding principles and inspiring examples should give you a good introduction to digital storytelling in higher education.